Presbyterians are distinctive in that we adhere to a form of government that stresses the active, representational leadership of both ministers and church members. 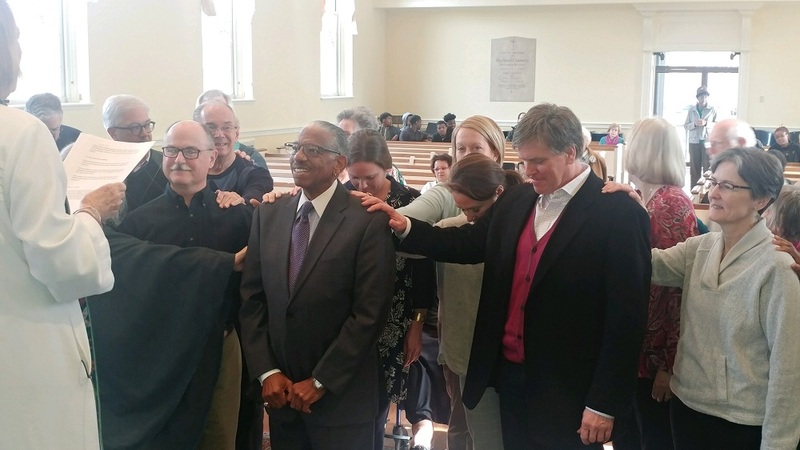 As Presbyterians, we are governed by the Session, a democratic, representative body of Faith members that provides a solid foundation of lay ministry and stewardship for our communal celebration of God’s words and work. Elders on the Session act on behalf of the congregation to approve policies and programs governing the life of our Church. Our Deacons seek to show God’s love in action, showing compassion, witnessing to justice, and working for the welfare of “the poor, the hungry, the sick, the lost, the friendless, the oppressed, those burdened by unjust policies or structures, or anyone in distress.” (The Presbyterian Church’s Book of Order.) Deacons guide our mission commitments both locally and abroad in addition to ministering to our homebound members and those in need. Dr. Springer leads the music ministry at Faith. He serves as organist and directs the Chancel Choir, the Bell Choir, and the Steel Drums. A frequent recitalist and accompanist, Dr. Springer has been a faculty member at Morgan State University since 2001 where he maintains both an organ and piano studio and teaches also courses in theory, choral literature, sacred music, and world music. He holds degrees from Trinity College in London, a Master of Music Degree from Yale University’s School of Music, and a Doctor of Musical Arts degree from the Peabody Conservatory of Music at Johns Hopkins University. A native of Barbados, Dr. Springer has formed an organization to provide musical and educational aid to a school in Cuba. Doris Cowan is a retired minister (Teaching Elder) of the Presbyterian Church (USA.) Doris lives in Baltimore city and is a Parish Associate at Faith Church, where she serves on the Worship & Arts committee and sings in the choir. She was a long-time member of Faith prior to her ordination. Doris recently served on the Preparation for Ministry committee of Baltimore Presbytery, and was sent by Baltimore Presbytery to the PCUSA General Assembly to be an Overture Advocate, advocating for the right of ministers to conduct same-gender weddings in states where that is legal. Ordained in 1989, she is a graduate of St. Mary’s Seminary. After ordination, she served as Interim Minister in six churches in three states. Her husband of 58 years, Ward, died in 2012. They are the parents of four children and the grandparents of three boys. They also have 10 grand-pets. Bill has taken a joyful and a dogged approach to ministry. Upon graduation from Illinois State University, he spent seventeen years in management for Walgreen Drug Store. Finding little satisfaction in that profession, he set off to seminary in Pittsburgh, in search of more meaning. Ordained in October of 1988, he was employed by the General Assembly of the Presbyterian Church (USA) as a fundraiser in 42 presbyteries. In 1993, he became Associate Presbyter for Baltimore Presbytery. His focus, over seventeen years, was new church development, church growth, and financial stewardship. Bill now volunteers at Faith Presbyterian Church.